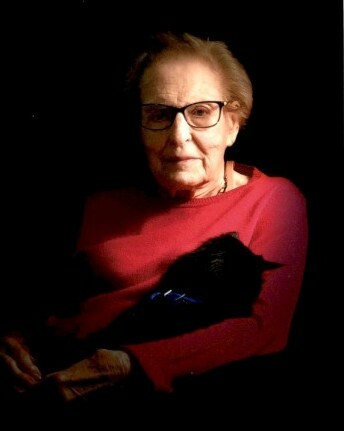 Velma Elizabeth Thompson, age 97, of New Haven, Connecticut, passed away on January 24, 2019. She was born on September 2, 1921, in Randolph, Nebraska to the late Merle Seymour King and Leola Freiburghouse, his wife. Mrs. Thompson attended Wayne State Teacher’s College in Nebraska and taught elementary school until her marriage to Clifford Thompson, They were the owners of Thompson Implement Company in Bloomfield, Nebraska until their retirement to Mesa, Arizona. Mrs. Thompson is survived by her daughter, JoAnne Thompson, and her daughter’s husband, James M. Dowaliby, M.D. ; her granddaughter, Shana Janos Gauvrit and her husband Nicolas Gauvrit of France and their children, Milo and Simon; and by a sister, Doris Passick of Florida. Mrs. Thompson was predeceased by her husband, Clifford T. Thompson and by her daughter, Joyce Lee Thompson. Mrs. Thompson will be buried at a later date at Mountain View Memorial Gardens in Mesa, Arizona, next to her husband and their daughter. Memorial contributions may be made to Branford Hospice.